Kolkata, Oct 25 (IANS) Melody queen Lata Mangeshkar mourned the demise of iconic vocalist Girija Devi, recalling her “good relationship” with the legend. 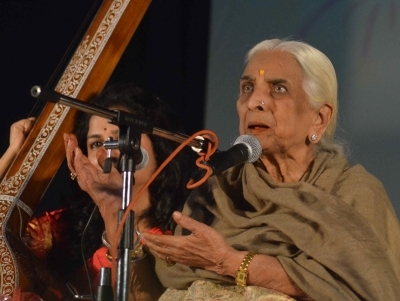 “Mahan shastriya aur thumri gayika Girija Devi ji hamare bich nahi rahi ye sunke mujhe bahut dukh hua. Hamare unke bahut acche sambandh the. (I am deeply saddened at her demise. I had a very good relationship with her),” Mangeshkar tweeted. “Girija Devi ji ek bahut acchi mahila thi. Main unko shraddhanjali arpan karti hun. ishwar unki aatma ko shanti pradan kare. (She was a very good human being. I pay my respects to her. May her soul rest in peace),” she said. The singer, a Thumri exponent, died on Tuesday following a cardiac arrest at a hospital in Kolkata. She was 88.